Offshore platforms in the Gulf or the North Sea. Remote deserts in the Middle East. Gas pipelines in the frozen Canadian frontier. Refining operations in India. No matter the location, no matter the type of oil and gas assets, ServiceMax helps companies across the entire oil and gas value chain execute more work, better work, and safer work on equipment. 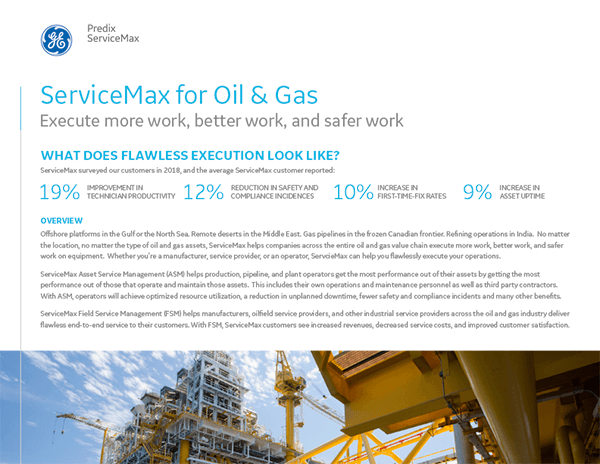 Whether you’re a manufacturer, service provider, or an operator, ServcieMax can help you flawlessly execute your operations.